It's estimated that there are more than 80 million dogs living with their human companions in the United States and approximately 45 percent of all households have a dog. More and more people want to know what their dogs think and feel and there is no shortage of research on these intelligent and emotional beings. Three recent books (The Genius of Dogs: How Dogs Are Smarter Than You Think (see also this), Domestic Dog Cognition and Behavior: The Scientific Study of Canis familiaris (see more here), and The Social Dog: Behavior and Cognition summarize much of what we know and the data base is growing rapidly. In this 60 Minutes online short video called "Does your dog really love you?," you will view some of the latest research on dog behavior. 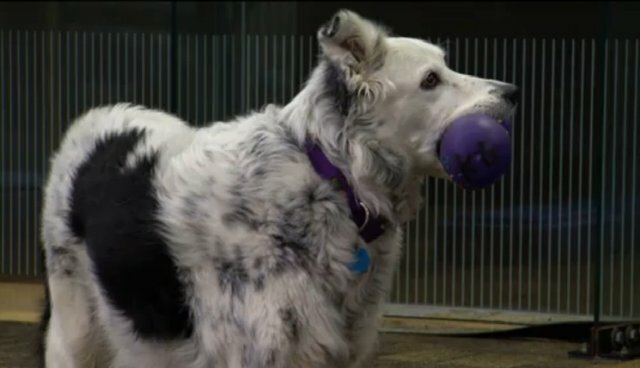 In this crash course with interviews by Anderson Cooper, you will learn about Wofford College's Dr. John Pilley's renowned Border collie, Chaser, who knows the name of more than 1,000 objects, Duke University's Dr. Brian Hare's research on dog cognition, and Emory University's Dr. Gergory Berns' use of neuroimaging to study what's going on in a dog's brain. Some teasers: Chaser is a dog genius. He knows the names of more than 1,000 objects and you'll see him perform. Although I've previously seen Chaser do his thing, I'm still amazed at how much he knows. Brian Hare shows some simple tests to show how dogs and young humans follow human pointing, whereas bonobos do not. Dr. Hare also talks about the "love hormone," oxytocin, and its role in the formation of close social bonds. And, Dr. Berns shows how the use of fMRI's can show us what's happening in a dog brain. When dogs sniff human odors, not surprisingly, the olfactory (smell) part of their brain lights up. But, when his dog smelled Dr. Berns' own odor, the pleasure/reward centers lit up, indicating recognition of his odor and a corresponding emotional response. I highly recommend this video to people of all ages. The combination of close observation along with non-invasive experiments and neuroimaging will surely help us learn more about what dogs are thinking and feeling, and what they want and need.